Rabbit recombinant monoclonal BDNF antibody [EPR1292]. Validated in WB, IHC, Flow Cyt, ICC/IF and tested in Mouse, Rat, Human. Cited in 62 publication(s). Independently reviewed in 4 review(s). This product may cross react with the following family members: NGF beta, neurotrophin 3, neurotrophin 4. The mouse and rat recommendation is based on the WB results. We do not guarantee IHC-P for mouse and rat. Synthetic peptide within Human BDNF aa 150 to the C-terminus. The exact sequence is proprietary. WB: Human, rat and mouse brain, hippocampus and cerebellum lysates. IHC-P: Human brain and bladder cancer tissues; Coronal sections from fetal (SNc) and post-natal (VTA) WT and Rgs6-/- mice.. ICC/IF: HeLa cells. Flow Cyt: HeLa cells. For BDNF, multiple WB bands are possible and expected. The human protein has 5 isoforms (precursors: 28 – 37 kDa) and can be glycosylated (Uniprot: http://www.uniprot.org/uniprot/P23560). The mature form is expected at ~14 kDa (monomer) and the dimer at ~28 kDa. Our Abpromise guarantee covers the use of ab108319 in the following tested applications. WB 1/1000 - 1/10000. Predicted molecular weight: 15 kDa.Can be blocked with Human BDNF peptide (ab182199). IHC-P 1/500. Perform heat mediated antigen retrieval before commencing with IHC staining protocol. The mouse and rat recommendation is based on the WB results. We do not guarantee IHC-P for mouse and rat. Heat up to 98 degrees C, below boiling, and then let cool for 10-20 min. For unpurified use at 1/100 - 1/250 dilution. For unpurified use at 1/750 dilution. During development, promotes the survival and differentiation of selected neuronal populations of the peripheral and central nervous systems. Participates in axonal growth, pathfinding and in the modulation of dendritic growth and morphology. Major regulator of synaptic transmission and plasticity at adult synapses in many regions of the CNS. The versatility of BDNF is emphasized by its contribution to a range of adaptive neuronal responses including long-term potentiation (LTP), long-term depression (LTD), certain forms of short-term synaptic plasticity, as well as homeostatic regulation of intrinsic neuronal excitability. Brain. Highly expressed in hippocampus, amygdala, cerebral cortex and cerebellum. Also expressed in heart, lung, skeletal muscle, testis, prostate and placenta. Belongs to the NGF-beta family. The propeptide is N-glycosylated and glycosulfated. Converted into mature BDNF by plasmin (PLG). 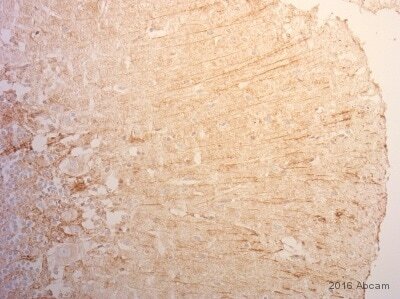 Immunohistochemistry (Formalin/PFA-fixed paraffin-embedded sections) - Anti-BDNF antibody [EPR1292] (ab108319)Image from Bifsha P et al, PLoS Genet, 11(10), Fig 7C.doi: 10.1371/journal.pgen.1004863. Co-immunofluorescence staining against tyrosine hydroxylase (TH; green), nuclear Dapi (blue) and BDNF (red, ab108319) in coronal sections from fetal (SNc) and post-natal (VTA) WT and Rgs6−/− mice. Scale bar 20 µm. Additional bands at: 15 kDa (possible mature (processed) protein), 28 kDa (possible multimer), 35 kDa, 45 kDa (possible immature (unprocessed)). We are unsure as to the identity of these extra bands. Immunocytochemistry/ Immunofluorescence analysis of HeLa (Human cervix adenocarcinoma epithelial cell) cells labeling BDNF with Purified ab108319 at 1:500 (0.6 µg/ml). Cells were fixed in 100% Methanol and permeabilized with None. Cells were counterstained with Ab195889 Anti-alpha Tubulin antibody [DM1A] - Microtubule Marker (Alexa Fluor® 594) 1:200 (2.5 µg/ml). Goat anti rabbit IgG (Alexa Fluor® 488, ab150077) was used as the secondary antibody at 1:1000 (2 µg/ml) dilution. DAPI nuclear counterstain. PBS instead of the primary antibody was used as the secondary antibody only control. Flow Cytometry analysis of HeLa (Human cervix adenocarcinoma epithelial cell) cells labeling BDNF with purified ab108319 at 1:30 dilution (10 µg/ml) (red). Cells were fixed with 80% methanol. A Goat anti rabbit IgG (Alexa Fluor® 488) secondary antibody was used at 1:2000 dilution. Isotype control - Rabbit monoclonal IgG (Black). Unlabeled control - Cell without incubation with primary antibody and secondary antibody (Blue). 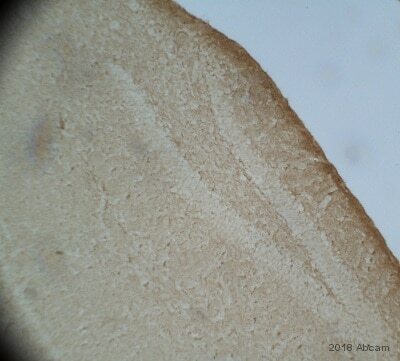 Immunohistochemical analysis of paraffin-embedded human brain tissue using unpurified ab108319 at 1/100 dilution. Immunocytochemistry/ Immunofluorescence analysis of HeLa (human cervix adenocarcinoma) cells labelling BDNF with unpurified ab108319 at a dilution of 1/750. Cells were fixed with paraformaldehyde and permeabilized with 0.5% Triton-X100 in PBS. ab150081 (1/200) was used as the secondary antibody. The antibody produces a strong, golgi-associated labelling pattern in both PF and MeOH fixed samples. Publishing research using ab108319? Please let us know so that we can cite the reference in this datasheet. People in one of our research project are interested in BDNF (brain derived neurotrophic factor). We’d like to know if there are antibodies which recognize only either the premature form or mature form of BDNF molecule? Thank you very much for the answer in advance! We have quite a few antibodies for BDNF. The antibodies ab108319, ab108383 ab109049 or ab72439 are against mature BDNF however ab78367 would detect the pro form. Thank you for contacting us and for your interest in our products. I think ab108319 (www.abcam.com/ab108319) or ab108383 (www.abcam.com/ab108383) would be suitable since you are looking for a monoclonal antibody. However, please note that none of these 2 antibodies is purified. Furthermore, as far as we are aware, ab108319 and ab108383 have never been tested in ELISA. All tested applications are specified on our datasheets, and these are updated as soon as any new information is brought to our attention. If you would like to test one of these antibodies in ELISA, please contact our Scientific Support team prior to the purchase by replying to this message as you may be eligible for our testing discount program. Otherwise, we like to encourage all of our customers to submit an Abreview via the online product datasheet. We always appreciate customer feedback, whether positive or negative, and we make all product information available to researchers. Plus, each Abreview earns Abpoints that can be used for discounts on future purchases or rewards such as Amazon.com gift certificates. To find out more about our Abreview system, please see the following link: https://www.abcam.com/abreviews I hope this information is helpful. Please do not hesitate to contact me for any further advice or information in this regard.